too hot to even think. It has been so hot and humid, that I have done nothing at the farm this week. I have been working on some of my art projects as I do have a show coming up in September. We did get the chicken tractor done, and the girls were quite happy to be out and about looking for new worms and the like. 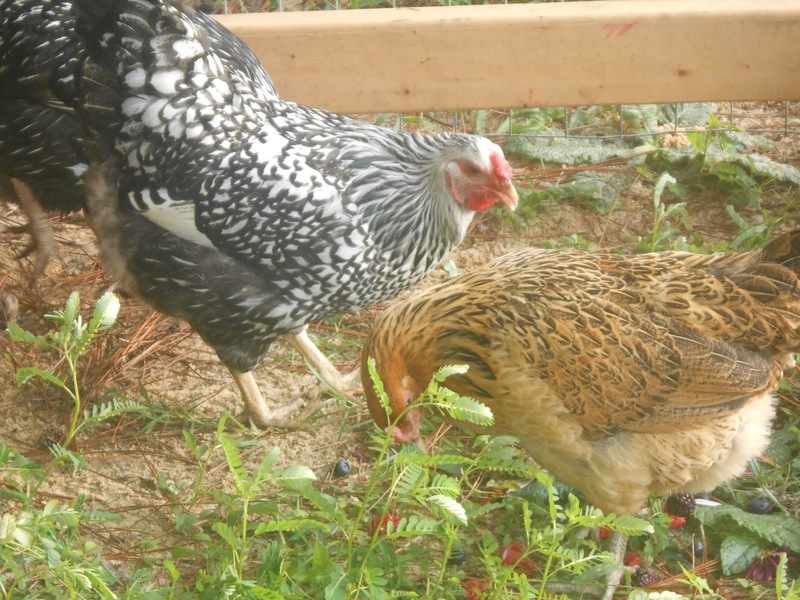 The photo is of two of my girls, Lacey, a silver lace Wyandotte, and Hawkeye, my beautiful Americana. They were enjoying their free time as I cleaned the chicken coop and spruced up the cage. There is a small house on the farm. I did live there when I was single, but not enough room now for two humans and 4 pets. We are going to get an air conditioner ( window unit) installed this week. It has become way too hot in the house, to even be comfortable there. and since I love to do my crochet there, I have not done any in a while. I am trying to get a farm management system going, whereby things that need to be done, are listed and taken care of in a more organized manner. This includes the harvesting of the trees, when they are ready, the cleaning of the property, and the management of new growth in the hammock area. I have several species of trees, that are not found in the area very often because they made good lumber and were often harvested for that reason. They include the Shumard Oak, White Oak, and Turkey Oak They grow up to 60 feet and have about a 40 foot span. Very straight and the canopy does not grow large in a forest. (These are all good for landscape trees). I also have abundent wildlife. There is a good flock or two of wild turkeys, and lots of deer. Also racoons, armidillos, and possums, Coyote, and a Bobcat that frequents the area. So I am always kept intertained with what I see out there. I mentioned the house there. My Dad built the house around an old one room house that was there when he purchased the farm. He enclosed the back porch and made that the kitchen. ( it may have been an outdoor kitchen to start with.) and added plumbing and another bedroom to the house. I was but a wee thing and altho I did try to help. I think I hid more nails then handed them to dad. 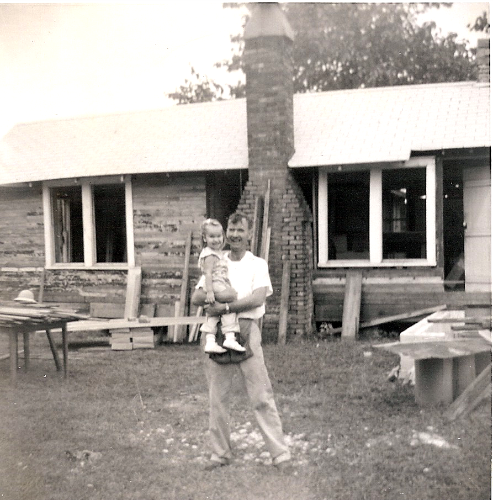 Yep that’s me and Dad Working on the farm house and that would be in the late 50’s . Yes the fireplace still works. Just no air conditioning. So come join me for more reminiscensing and fun down on the farm.